Simply put, when an employee announces their resignation, they are giving notice of their intention to leave. Running a business would be hard if the staff could get up and walk out the same day. Who would do their work? Where were they on particular projects or sales progressions? 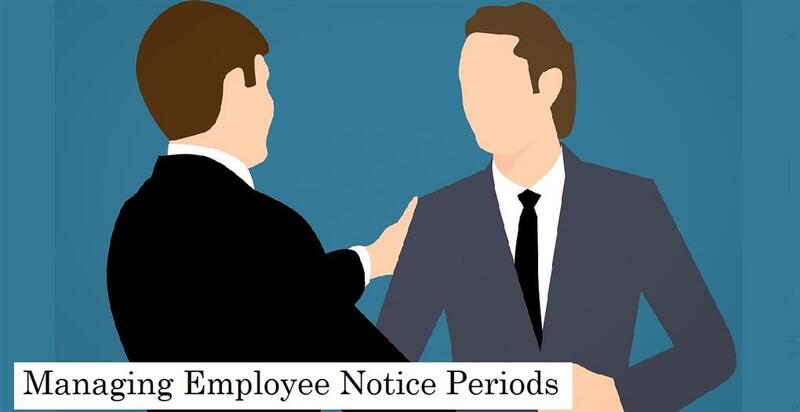 The notice period is, therefore, a contractual period (the length is in the employment contract) where the employee has to remain within the business. Now, the company has time to recruit a replacement and to reassign the leaver’s workload. It keeps disruption to a minimum. Are notice periods longer for senior managers? In many cases, yes. As an employer, you want to protect your interests by extending the notice period for senior management. Three months is common, while the highest company positions might be six months or even longer. Should you force an employee to serve their notice period? Employees working the full notice period may be at best unhappy and at worst disruptive. You have to strike the right balance before letting them go. Your priority is the smooth running of the business, and you can’t let anyone go without having replacements in place. Sometimes, however, the relationship is so strained that keeping the leaver in the office has a negative impact. Especially in a sales environment, where morale and team spirit are so important. Another scenario is when the leaver simply walks away. You stop paying them immediately, and you are within your rights to pursue them legally for breach of contract. However, the cost of legal action is prohibitive and pretty pointless as the person is leaving anyway. It’s also not good for office morale. In these situations, it’s always best to try and reach a compromise before things get too out of hand. So, for example, if you have a sales executive on one month’s notice who wanted to leave immediately, perhaps agreeing on them staying for two weeks would prevent them walking out AND give you time to plan for a replacement. What exactly is gardening leave? One of the primary employee rights after resignation is to receive full pay during the notice period. However, there are circumstances where you might not want the employee to remain working with you. What if the leaver was jumping ship to join a competitor? Clearly, in these circumstances you don’t want them in your office a moment longer, where they might have access to valuable company information, secrets their new employer would love to know. Equally, you don’t want to agree to an instant leaving date since that would only help your competitor. It’s in these cases where gardening leave is appropriate. Here, you continue to pay the leaver in full for the whole notice period, but on the condition that they remain “at home” and do not start work elsewhere. It’s called gardening leave because it’s supposed the leaver has nothing else to do, so tends to the garden. As you’ll have seen, there are options open to you as an employer when staff hand in their notice. It’s a fine line between making sure you have continuity of service when someone leaves, and them staying and being disruptive or affecting morale. You want to earn a reputation for being fair, but there’s nothing wrong with being firm, too. Be too lenient, and every leaver will expect the same treatment. Whichever way you go, you do have to remain consistent, so that everyone knows where they stand. In reality, most people will respect your business for playing fair, and if they do have to stay for a portion of their notice period, they’ll be more likely to remain productive. While we’ve focused here on notice periods when your staff leave, and why it’s important, keep this in mind when the shoe is on the other foot, and you’re recruiting a person from another company. While you want them to join as soon as possible, you’ll have to respect the notice period at their current employer. You can’t have it both ways!